In Info Mgmt, Publishing, References, Talks, Tutorials, Yahoo! 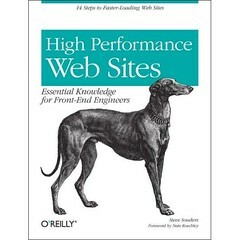 Steve Souders wrote High Performance Web Sites: Essential Knowledge for Front-End Engineers last year for O’Reilly. He generously invited me to write the foreward. The book was published about six months ago, but in writing the my last blog post (on the 20 new rules just released) I noticed that I didn’t have an easily-accessible copy of my contribution. So, please forgive me for pasting it here for future reference. You’re lucky to be holding this book. More importantly, your web site’s users are lucky. Implement even a few of the 14 techniques Steve shares in this groundbreaking book and your site will be faster immediately. Your users will thank you. Here is why it matters. As a frontend engineer, you hold a tremendous amount of power and responsibility. You’re the users’ last line of defense. The decisions you make directly shape their experience. I believe our number one job is to take care of them and to give them what they want—quickly. This book is a toolbox to create happy users (and bosses, too). Best of all, once you put these techniques in place—in most cases, a one-time tweak—you’ll be reaping the rewards far into the future. I’ve applied his findings to several sites. Watching already-fast sites render nearly twice as quickly is tremendous. His methodology is sound, his data valid and extensive, and his findings compelling and impactful. The discipline of frontend engineering is still young, but the book in your hands is an important step in the maturation of our craft. Together we’ll raise expectations about the Web by creating better and faster (and therefore more enjoyable) interfaces and experiences. In Browsers, Engineering, Events, Front End Engineering, Publishing, References, Talks, Tutorials, Yahoo! The 34-Blade Razor from Yahoo! Congratulations to my friend and colleague Stoyan Stefanov for the publication of Yahoo!’s Latest Performance Breakthroughs after presenting them at the PHP Quebec Conference in Montreal last week. The 20 new tips bring to 34 the total performance tips his team at Yahoo! has published in the past two years. I agree. That’s why I was honored to help disperse their 14 Rules for Faster Web Sites in my presentation at the @Media conference in London last year. Read more about Yahoo!’s Latest Performance Breakthroughs on the Yahoo! Developer Network site. In Design, Engineering, Events, Front End Engineering, Talks, Travel, Yahoo! The Web is not Print. I’ve said it a million times. But it took the master, Khoi Vinh, to express why. He doesn’t have all the answers yet, but he states the problem space more clearly than I’ve heard elsewhere. And that’s half the battle. Here is his presentation posted on Slideshare. If you’re involved in web design or web development, do yourself a favor and click through it. It’s called "Control". He is, of course, a great storyteller, so while I’ll post a few quotes here you’re much better off reading his slides directly. If narrative is the guiding principle of traditional design, then control is its most important tool. But the guiding principle of interactive media is not narrative — it’s behavior. Designing for behavior means transferring some measure of control from author to user. What are we designing? Digital media is as different from print as a speech is different from a conversation. They’re both exchanges of information between people. But one is a controlled environment and the other is uncontrolled. In fact, what we’re talking about here is the difference between documents and conversations. Digital media looks like writing, but it’s actually conversation. This push and pull is essential to media evolution. Documents and conversations are not mutually exclusive. They are inherently dependent upon one another. I just received word that one of the better conferences around is back for another year. Web Visions, the annual event in Portland, Oregon, will be May 22-23 (Thurs-Fri). Join the rockstars of design, user experience and business strategy for two days of mind-melding on what’s new in the digital world. Get a glimpse into the future, along with practical information that you can apply to your Web site, company and career. Session proposals are being accepted under the end of 2007. It’s really a lovely conference, and I recommend that you check it out if you’re in the area (note that it’s light on dev and high on design topics). I love that it’s smaller and more personable. Plus, the friendly, thoughtful vibe that is Portland carries into the conference itself. It attracts more passionate folks instead of 9-5ers, and that’s a good thing. Plus, it’s especially affordable. Registration isn’t online yet, but sign up on their site to be notified. I submitted a session proposal for the 2008 South by Southwest Interactive Festival. There are about 600 proposed talks and panels. Only a fifth of those will be chosen. Though there’s an editorial aspect to the selection process, the primary factor is democratic. So, if you would, please take a moment to review the description of my session and vote for it if you find it interesting. You need to register on their site before you can vote, but it only takes a second. An immense body of theory and practice in the front-end engineering discipline has evolved in the past decade, particularly in the past four years. This talk draws from my forthcoming O’Reilly book, separates signal from noise, and codifies the state of the art of Professional Front-end Engineering.